Rita used her nursing experience and tenacity to launch Stroke Action Nigeria to change outcomes for people in a region with one of the highest stroke rates in the world. After her aunt suffered a stroke in Nigeria and had few options for treatment and rehabilitation, After her aunt suffered a stroke in Nigeria and had few options for treatment and rehabilitation, Rita Melifonwu used her nursing experience and tenacity to launch Stroke Action Nigeria (SAN) to change the trajectory and outcomes for people in a region with one of the highest stroke rates in the world. Rita's New Idea: Rita brings a first-of-its-kind, comprehensive stroke prevention, treatment and rehabilitation strategy to Nigeria, equipping citizens with resources and information so they can take charge of their own health. Through Stroke Action Nigeria (SAN), Rita proves that with proper management, funding, public awareness and access to medical equipment and treatment, it is possible to provide effective stroke care and prevention—even in remote areas. Rita and SAN implement aggressive awareness strategies that educate people about ways to prevent stroke. By advocating for government support and working with healthcare professionals to implement best rehabilitation practices, she is reducing stroke occurrences and enhancing the quality of life for stroke survivors. Rita is also empowering stroke survivors to become self-advocates who improve their own wellbeing, change policy and unlock economic opportunity for themselves. Expeditious care after a stroke is crucial in terms of having a rapid recovery and Rita is increasing visibility for this critical requirement. She partnered with the Federal Ministry of Health to include stroke prevention and care on the national agenda and is now working in nine states in Nigeria and continues to expand nationally. 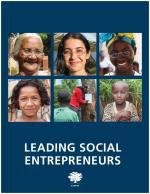 Rita' s story appears in the 2018 edition of "Leading Social Entrepreneurs" which features a selection of just a few of the Ashoka Fellows recently brought into the largest global network of social entrepreneurs. The LSE presents some of the newest innovations by leading social entrepreneurs whose ideas are changing the way things are done all over the world.